The new Cooler with You Card Kit is available NOW! Quick, go grab yourself one HERE before they sell out! This is such a fun kit to play with! I stamped all the images on X-Press It card stock and I coloured the images with Copics. I then die-cut all the images with the coordinating dies. Once the images were all cut, I assembled the sweet scene. What a cute wintery scene. I love the blue sky on your card. It really makes all of the other elements stand out! Just love your cute scene you created. So cute and such a fun kit! Thanks for the inspiration! Love these cute snowmen & penguin. So cute! I love this card! So sweet! This is lovely. I am falling in love with these cute snowmen. Snowmen and birdies...doesn't get any better...so cute! Beautiful coloring & darling card! Gorgeous kit and fun fun work! I love how all the elements you need are included with this kit. The trees and birds, etc. It makes it so easy to put cute cards together. Thanks! So cute! Love the colors and your coloring is fabulous. Wauuu.. Adorable. Beautiful coloring and colors.. I love whole scene that you created! !Thanks for sharing! Super fun! I love the colors you chose and especially the way the cardinals are resting on the snowmen's arms! Thanks so much for sharing! What an adorable card. So sweet. Your adorable and creative scene just makes me smile! Awesome card! The saying is so cute & I love those darling snowmen! Very cute and colorful scene. Love the colors on your snowmen- makes me think of the Seahawks! 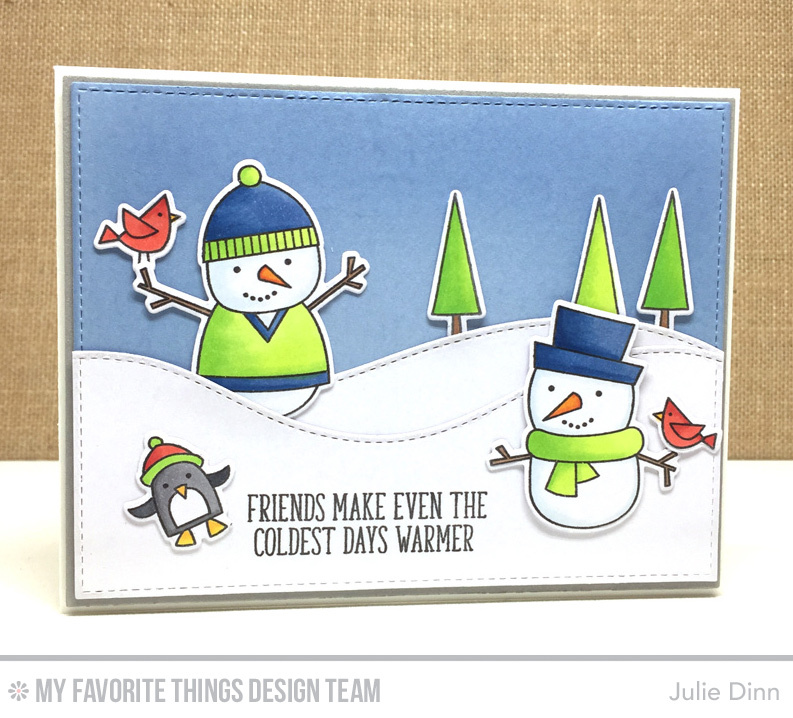 Sweet scene with adorable snowmen! You made a really fun scene. Love the sky and the penguin. Looks like he is making a snow angel. Adorably cute card! Love the bright colours!